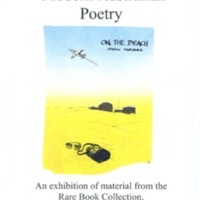 The exhibition was held in the Rare Books Exhibition space, Sir Louis Matheson Library, Monash University from 18 March - 19 May 1999. This exhibition shows some of the extensive collection of Australian literature held in the Monash Rare Book collection. Items displayed range from the 1920s to the late 1990s and include examples of the works of many of Australia's most important writers, e.g. Kenneth Slessor, A.D. Hope, Judith Wright, and Patrick White. The poets and the literary periodicals of the '70's, 80's and '90's were well represented.